The Lady Flames basketball team fell short Tuesday, Feb. 5, to the Stetson Hatters 68-56. Tuesday was Liberty’s first loss since Jan. 12 after winning their previous five games. Turnovers were a factor throughout the game. Liberty had trouble controlling the ball, and when they turned the ball over, it led to points for Stetson. In the first quarter, Stetson had 11 points off turnovers while Liberty only had three. Overall, Stetson outscored Liberty off turnovers 22-8. 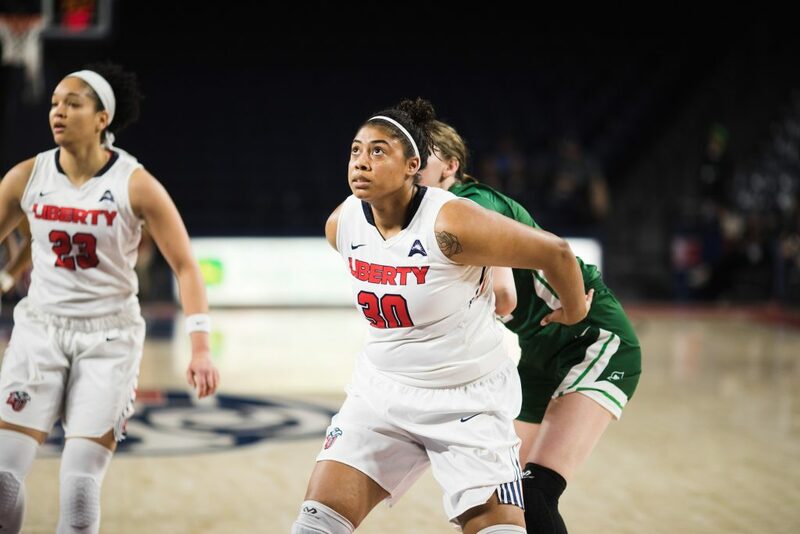 Stetson capitalized on those opportunities, while the Lady Flames turnovers led to a lack of offensive rhythm for Liberty and 36.5 percent shooting from the floor. Throughout the game, it looked as though Liberty could not keep up with Stetson. The Lady Flames were missing redshirt sophomore guard Ria Gulley due to illness and sophomore guard Ashtyn Baker due to an injury. Playing with two players down led to the Flames consistently looking fatigued and outmatched on the court. STOPPED — Lady Flames senior KK Barbour boxes out a defender. Stetson established dominance in the paint from early in the game. In a first quarter where Stetson established a 12-point lead, they outscored Liberty in the paint 10-4. A big part in this was Stetson freshman forward Megan Vincent. In the first quarter, she scored 10 points with a perfect field-goal percentage. This would continue throughout the game, Vincent only missing one shot all day while putting up a career-high 22 points. Stetson led 35-25 going into the half. Liberty responded in a big way by beginning the third quarter with a 16-6 run to tie the game at 41-41. A major contributor was Lytle, who scored 12 points in the quarter. This included a perfect 3-3 from three-point range. However, Liberty’s turnover woes returned, leading to Stetson responding with an 11-4 run to end the quarter. Lytle was the most notable performer for the Lady Flames as she finished with 17 points and five rebounds. Senior forward KK Barbour had 12 points, all of which came in the first half. This is Barbour’s sixth consecutive game in double digits. Stetson’s Megan Vincent scored 22 points on 90 percent shooting and pulled down 9 rebounds for Stetson. Three other Stetson players scored in double digits. Liberty will attempt to bounce back next week when they host Lipscomb Tuesday, Feb. 12 at 7 p.m., then travel to take on North Alabama Saturday afternoon. North Alabama is ranked second in the ASUN conference, and the game will be Liberty’s first time playing them this season.